HoopsMania is an exciting sweepstakes fundraiser based on college basketball’s national championship tournament in March. Sweepstakes participants can win $1,000s in cash prizes based on the number of points scored by the basketball teams printed on their sweepstakes game cards. Click on this great video to learn how our $20 HoopsMania fundraiser works. Click on this great video to learn how our $5 HoopsMania fundraiser works. Click on this great video to learn how our $10 HoopsMania fundraiser works. HoopsMania is an exciting sweepstakes fundraiser based on college basketball’s national championship tournament in March. Each HoopsMania game cards contain 8 random college basketball teams that will play in the tournament (you get 2 teams from each region). All cards have seeds 1 through 8 printed on them so everyone has an equal chance of winning. 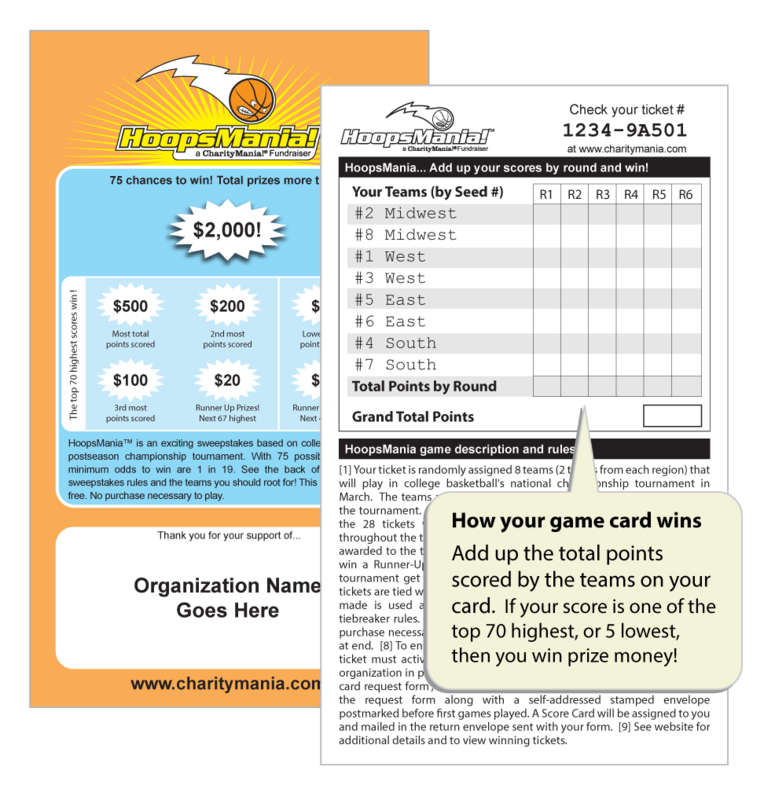 During the basketball tournament, participants simply add up the points scored by the teams printed on their game card. Prizes are awarded to the 70 game cards whose teams score the most total combined points throughout the tournament. In addition, the 5 cards with the lowest total points scored also win! There are 75 chances to win a prize and 1,440 unique tickets, each of which has an equal 1 in 19 chance to win a prize. Determining your profit with HoopsMania is easy. To raise money, you sell CharityMania Tickets for $10 and keep 70% of the money you collect. Ticket holders receive $10 worth of premium digital music downloads (read why the music is important for this fundraiser), and they are entered into the HoopsMania sweepstakes. Sell 10 tickets or 10,000 tickets… you make $7 on every ticket. It is really that simple. You determine how many CharityMania Tickets you need and then purchase them from us for 19¢ per ticket (to cover the printing costs) plus shipping and a $10 handling fee per order. You then sell each CharityMania Ticket for $10. With each sale you pay $3 to CharityMania to cover the costs of the music downloads, the management of the sweepstakes, and any prize money your game cards may win. The remaining $7 is your profit! You pay $3 for only those tickets you sell. View our Financial Flowchart (PDF) for more details about how and when payments are made during the fundraiser. Determining your profit with HoopsMania is easy. To raise money, you sell CharityMania Tickets for $20 and keep 70% of the money you collect. Ticket holders receive $20 worth of premium digital music downloads (read why the music is important for this fundraiser), and they are entered into the HoopsMania sweepstakes. Sell 10 tickets or 10,000 tickets… you make $14 on every ticket. It is really that simple. You determine how many CharityMania Tickets you need and then purchase them from us for 19¢ per ticket (to cover the printing costs) plus shipping and a $10 handling fee per order. You then sell each CharityMania Ticket for $20. With each sale you pay $6 to CharityMania to cover the costs of the music downloads, the management of the sweepstakes, and any prize money your game cards may win. The remaining $14 is your profit! You pay $6 for only those tickets you sell. View our Financial Flowchart (PDF) for more details about how and when payments are made during the fundraiser. Determining your profit with HoopsMania is easy. To raise money, you sell CharityMania Tickets for $5 and keep 65% of the money you collect. Ticket holders receive $5 worth of premium digital music downloads (read why the music is important for this fundraiser), and they are entered into the HoopsMania sweepstakes. Sell 10 tickets or 10,000 tickets… you make $3.25 on every ticket. It is really that simple. You determine how many CharityMania Tickets you need and then purchase them from us for 19¢ per ticket (to cover the printing costs) plus shipping and a $10 handling fee per order. You then sell each CharityMania Ticket for $5. With each sale you pay $1.75 to CharityMania to cover the costs of the music downloads, the management of the sweepstakes, and any prize money your game cards may win. The remaining $3.25 is your profit! You pay $1.75 for only those tickets you sell. View our Financial Flowchart (PDF) for more details about how and when payments are made during the fundraiser. Sweepstakes participants can win $1,000s in cash prizes based on the number of points scored by the basketball teams printed on the backs of their Sweepstakes Game Cards. After the tournament CharityMania calculates the winning game cards. We then send you the prize money so that you can send it to the winners with a personalized letter thanking them for their support. These one-page sheets are great when discussing the fundraisers. They contain all the important facts about the fundraisers. HoopsMania begins on March 21. Make sure you order your tickets early enough to distribute and sell them before the sweepstakes begins.